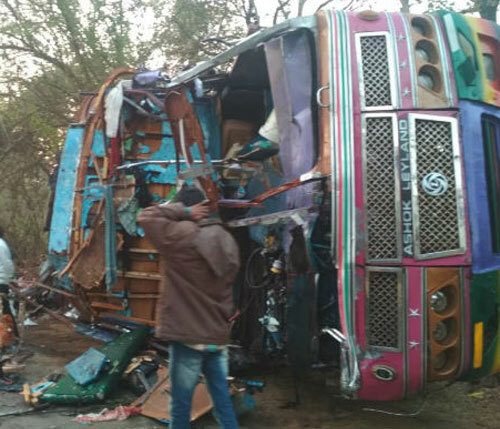 Shivamogga, 23 Mar 2019 [Fik/News Sources]: In an accident that occurred at Iginabailu Cross of Sagar taluk in the district on the wee hours of Saturday, March 23, three people lost their lives on the spot when a truck laden with LPG cylinders collided with a lorry. The truck laden with LPG cylinders was going towards Sagar, where as the other lorry which was carrying tar was moving on the opposite direction of Shivamogga. Both collided head- on. The identity of the deceased people is yet to be known. One person is seriously injured in the accident and is hospitalised. Both the trucks are mangled in the accident. The traffic on Tumkur-Honnavar national highway was stalled for sometime due to the accident.